It's day 6 of our Blog Hop! And we are excited to have Judi@greenfairyquilts participate in our blog hop!! We! Love! Judi!! We got to spend some time with Judi at Quilt Market last spring! She fit right in with me and my sisters and niece. She just so happen to have her beautiful Book quilts with her and we got to drool over them up close in our Hotel room! 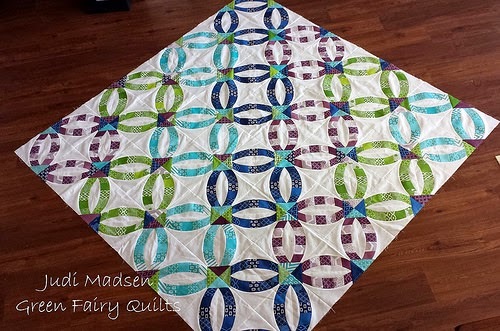 She recently finished her Metro Rings quilt top and I love how she put hers together!! Go check out Judi's post today and her awesome giveaway!! , come on guys we’re only 2-0 down, if we can look to improve just a litlte bit i am sure we can gets these .Obviously there is an implication that the team didn’t play well enough, but we need to encourage them to the next level and to improve, we cannot bully people to improvement.Obviously some people react differently to different stimuli, but in general we need to encourage people, tell them how we can turn this around. If we can just step up our energy levels a litlte bit, improve the quality of our passing and tackling then i think we could maybe score a quick goal and then we are right back in the game, but with the momentum in our favor. Lets come out attack right from the start, lets take them by surprise. I believe we can win this, we’re just need to step it up and get an early goal.I am convinced that this approach would have much better results. When you try to motivate ppleoe away from their current situation it invariably requires you to tell them what their current situation is, which basically results in negative criticism. Would fully agree about the statement for the positive image. For the quoted part would raise a question How individuals would understand that status quo is not so good for the entire organisation and themselves without knowing possible negative impact of keeping things as they are? From my perspective right balance of positive future and neutral or negative current would make sense, negative should be applied to situation and actions performed but not personalities of course, what do you think? Hey guys, if you want to make a little free money then dolnwoad Juno wallet and put in the code LB1789421 to start off with a cash bonus. Then you can continue to earn money as long? as you desire. Good luck? making money!